It's Gonna Frost Again - No Worries! Mia Gets an EarthBox® ! 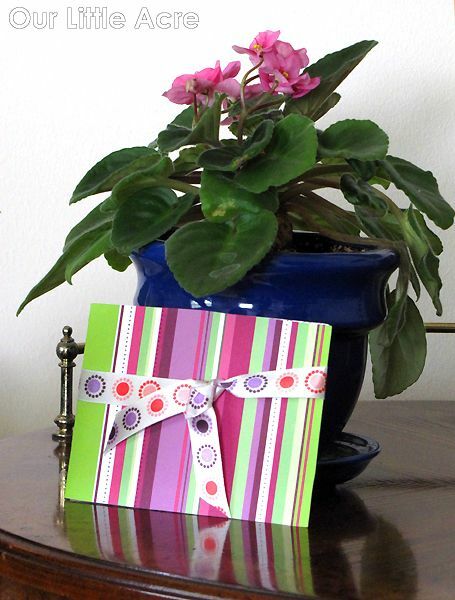 Didn't Get an EarthBox® the Last Time? WIN ONE! Spring came in at the speed of light and we've been getting almost comfortable with it as each day passes without a hard freeze. We've had a couple of nights with light frosts, but so far no damage. Part of that is due to my use of FreezePruf ™ on some of my more tender plants. I received a bottle of FreezePruf™ (made by the Liquid Fence® people) to test last fall, but we'd already entered the period of regular nightly frosts, so I saved it to try this spring. How does FreezePruf™ work? Without going into technical data and biological jargon, you spray it on the foliage of your plants, ideally when the temperatures are above 50° and eight hours before the frost is due to arrive, and it will protect your plants from damage by 9.4°. That means they should survive temperatures down to 23°, depending on the plant. Once treated, the protection can last up to six weeks, although you should spray any new growth after the first application. Last night, we were under a frost/freeze warning and the same is forecast for tonight. I'll admit, I did cover my tree peonies, which are in full bud, only because it was easy to do so. But with a garden the size of ours, it's virtually impossible to cover everything that might get nipped by the frost. I sprayed FreezePruf™ before the last frost more than a week ago and nothing that was left uncovered suffered a bit of damage. We got down to 28° that time. Last night, the thermometer dipped to 29° and once again, no damage. 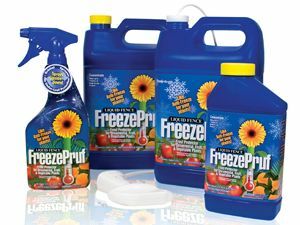 With FreezePruf™ providing protection for so long after application, this is really an economical way to save your plants from damage without having to cover things every night and making it look like the blanket fairy threw up on your yard. No more panicking over late frosts! Even better - it's non-toxic. 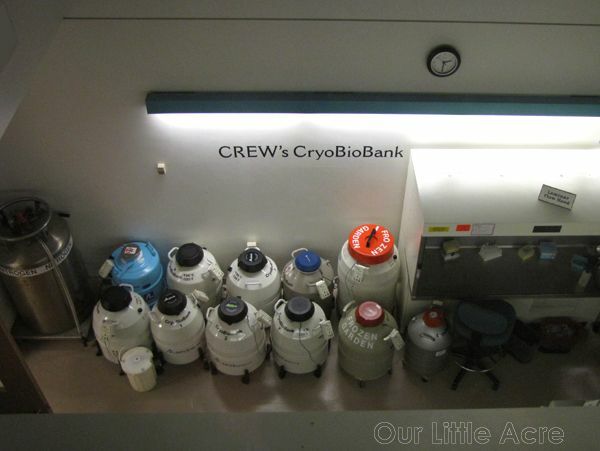 For more information about how FreezePruf™ works, visit their website. I've put off blogging about my two-day trip to Cincinnati last week for the GWA Region III Meeting and Cincinnati Flower Show, because I hardly know where to start to recount all the fun Mom and I had. Not kidding either. It almost reminded me of the time that I went on our older daughter's 8th grade trip to Washington, D.C. Not a wasted moment! 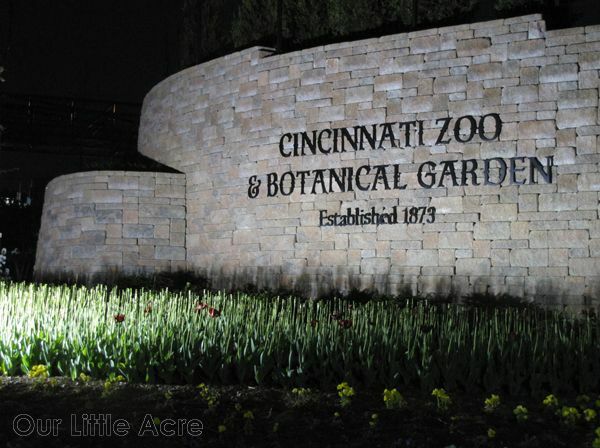 The meeting was held at the Cincinnati Zoo and Botanical Gardens, which was an excellent choice of venues. 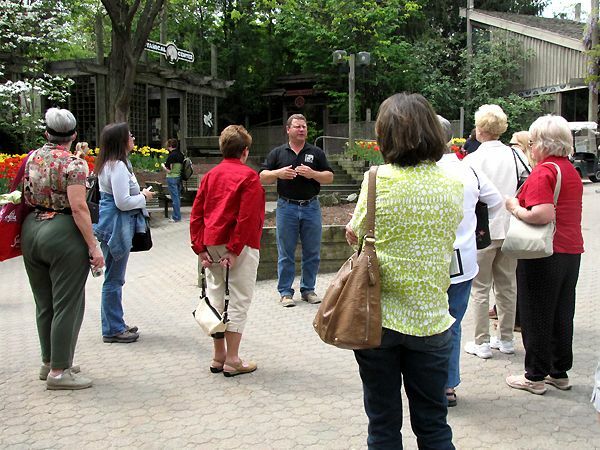 After visiting the Toledo Zoo a few weeks ago with my Master Gardener class, and now this one, I'm beginning to think that zoos are a well-kept secret when it comes to horticulture. We had a pizza and salad lunch to start out, and I spent most of my time renewing friendships with those I'd met before (Carol of May Dreams Gardens and Carolee of Carolee's Herb Farm), meeting friends I'd made on Twitter and Facebook (Patty Craft from Horticulture Magazine, Maria Zampini from Lake County Nursery, and Stacy Walters from The Good Life With Stacy), and chatting with all the other wonderful people that were in attendance. 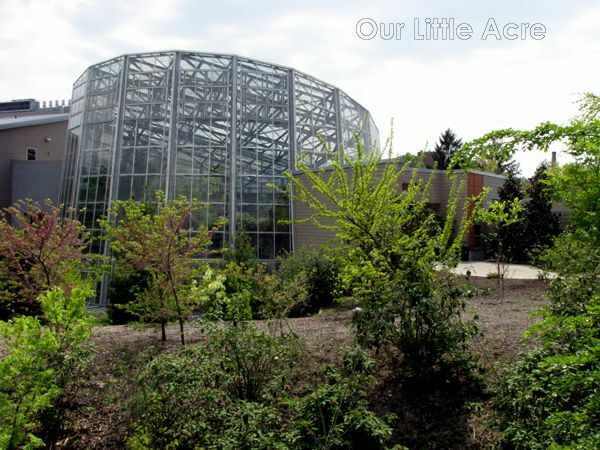 After we got our tummies full, we embarked on a short tour of some of the zoo's horticulture facilities, namely the CREW (Conservation and Research of Endangered Wildlife) building, where research takes place. 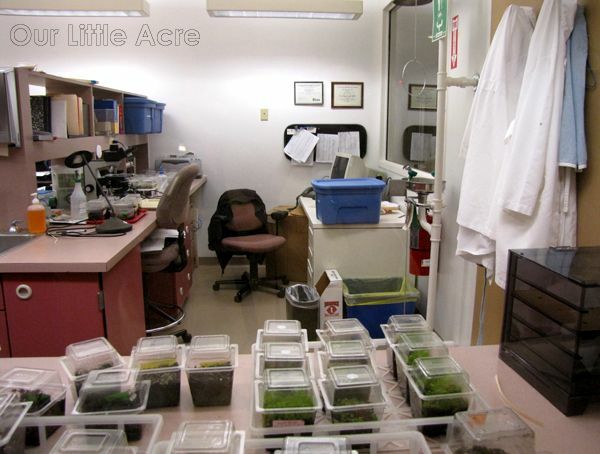 It is a state-of-the-art facility devoted to the preservation of endangered animals and plants. 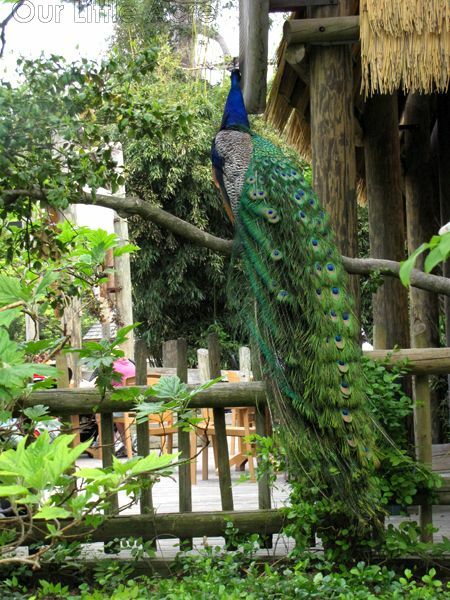 One of the goals of the center is to propagate and reintroduce endangered species so as to preserve them and increase their population in the wild. 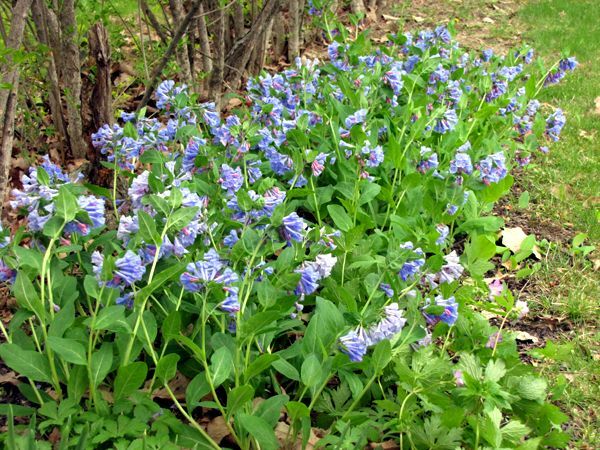 One of the plants they are actively working on is the Northern Wild Monkshood (Aconitum noveboracense), growing near Akron, Ohio. 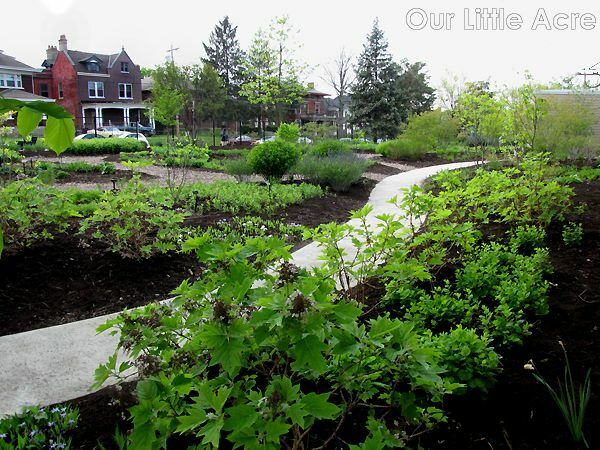 The zoo has a large rain garden which contains a number of native plant species. As we walked the zoo grounds, only occasionally were we reminded that we were in a zoo, since we were so focused on the horticultural treasures here. 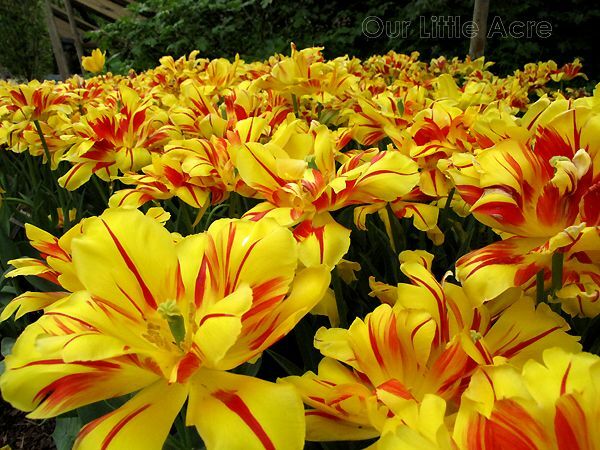 Though we didn't get to see the thousands of tulips in all their glory, due to the early spring, there were enough blooming that the display was still impressive. 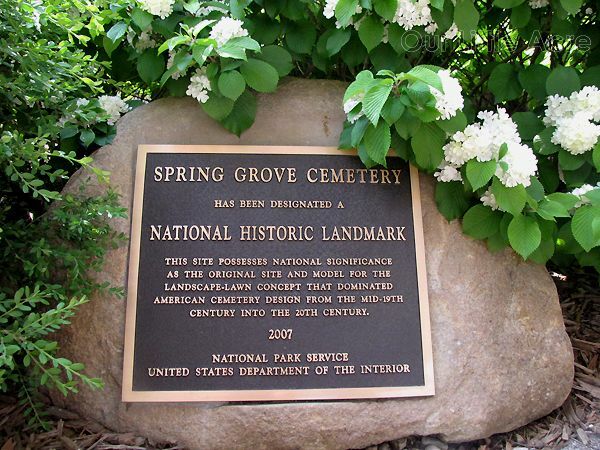 After the short zoo tour, we drove to Spring Grove Cemetery and Arboretum, where we took a short walking tour. 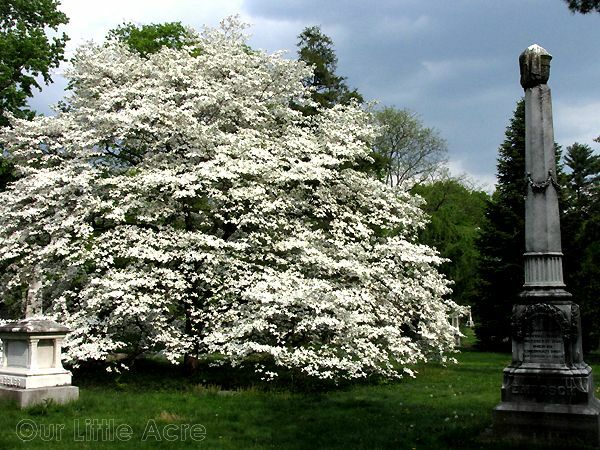 In addition to many famous people being interred here, it is home to 21 state champion trees and 2 national champion trees. Look at the size of its blooms! We returned to the zoo for dinner, where we were privileged to hear two speakers: Brian Jorg, who spoke to us about spring wildflowers (a favorite topic of mine!) and Steve Foltz from PlantPlaces.com, which is a database of the location of specific plants, including trees. On this website, you can see photos as well as find the location of the actual plant, as the GPS coordinates are included in the listing. The meal was wonderful and the chocolate lava cake dessert really hit the spot. But the pièce de résistance (for me, anyway) was when the lovely Patty Craft drew names for the gifts provided by the sponsors. 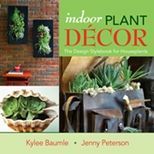 There were t-shirts, planter boxes, color wheels, and two gift certificates for plant samples from Proven Winners for next spring, among other things. Guess whose name was drawn for one of the Proven Winners certificates? The garden writers were also gifted with wonderful swag bags containing books from Timber Press, plants and idea books from Proven Winners, plants from Lake County Selections, gloves from Womans' Work, a certificate for plant samples from Blooms of Bressingham, seeds from Natorp's (a local independent garden center), a nylon bag, hat and magazines from Horticulture Magazine, and many informational tidbits. I'll be blogging about the second day of the meeting, too. Yes! There's more! 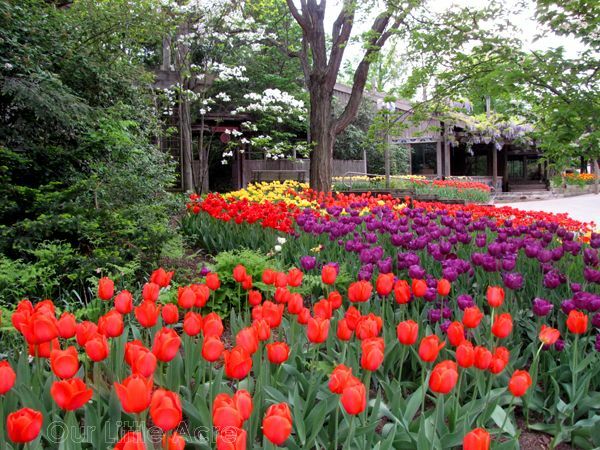 The Cincinnati Nature Center, Bill Lee's Garden, Beth Karp's garden, and of course, the Cincinnati Flower Show. Stay tuned! 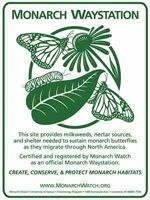 Thank you to those who made all of this possible - the sponsors, the GWA, the Cincinnati Zoo, Spring Grove Cemetery, and the Cincinnati Flower Show. I hope I didn't miss anyone! 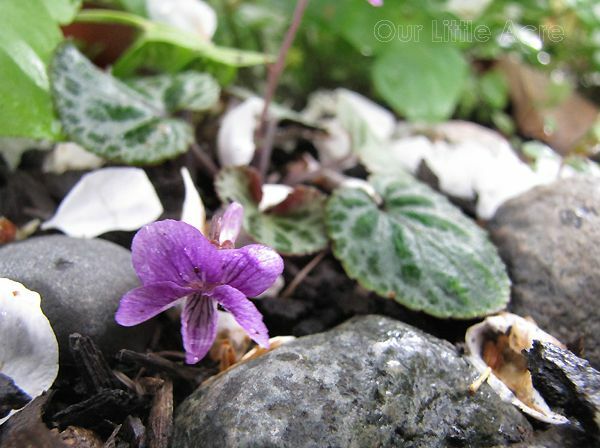 You may remember how excited I was last summer to find a little seedling of a Korean Violet that had disappeared from my garden a few years ago. I had carefully dug it from where it had miraculously popped up, several feet from its original location, and planted it in a more protected location. Small rocks were placed around it to remind me that the tiny treasure was there. 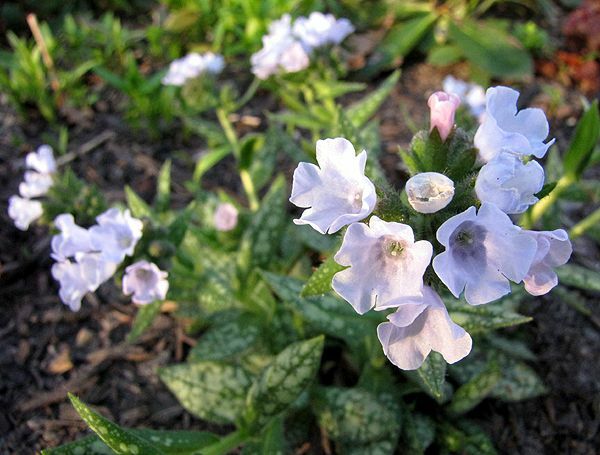 At some point, it bloomed, because I saw the open seed pods and was thrilled at the prospect of it doing what most violets do quite well - that of spreading. 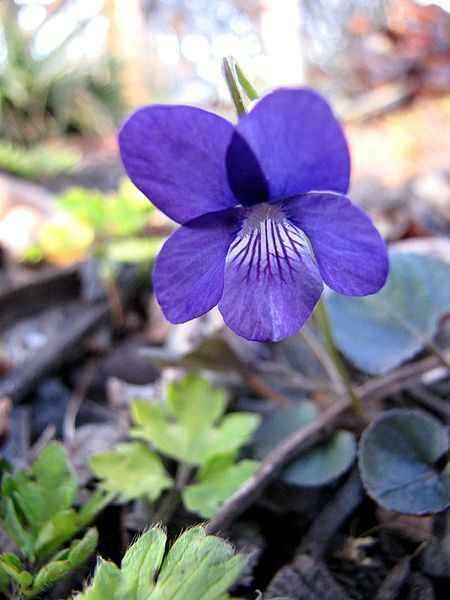 While common wood violets can be annoying with their proliferation, I don't mind, and I certainly won't mind if this particular species decides to attempt a garden takeover. 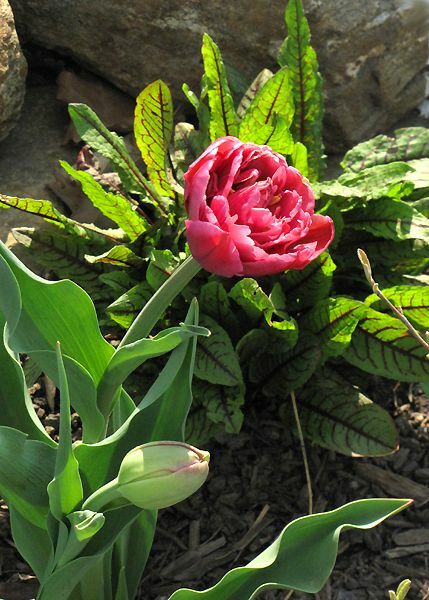 I'm happy to say that it made it through the winter, and is now blooming. 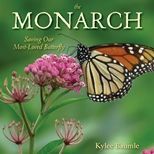 I'm going to try to monitor the seed production so that I can collect it and give each seed the best chance possible to germinate. On Friday, as Mom and I drove home from the Cincinnati Flower Show, we stopped at Natorp's Garden Store, where I purchased a Toad Lily (Tricyrtis sp.). Nestled down in the pot was a bonus: Two small Korean Violet seedlings! Maybe I'll have my own little colony after all! I'm not sure I'd heard of lingonberries before I visited an IKEA store last year, while in Cincinnati for the flower show. For sure, I'd never tasted them before. Yum! That wonderful culinary experience made me want to grow lingonberries here at Our Little Acre if it was at all possible. Research online told me that they're hardy from zones 2-6. 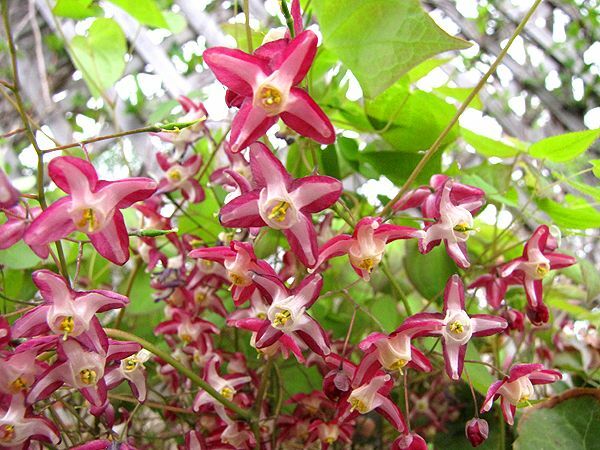 They detest hot weather and grow best in open shade. They also detest alkaline soil. Guess what we have here? Alkaline soil. But blueberries like acidic soils too, as do azaleas, and I have been successfully growing those for a couple of years now. So, I took the plunge and bought four lingonberry plants from Miller Nurseries in New York, the same nursery where I bought our new apple trees. The plants were small, but nice and healthy. 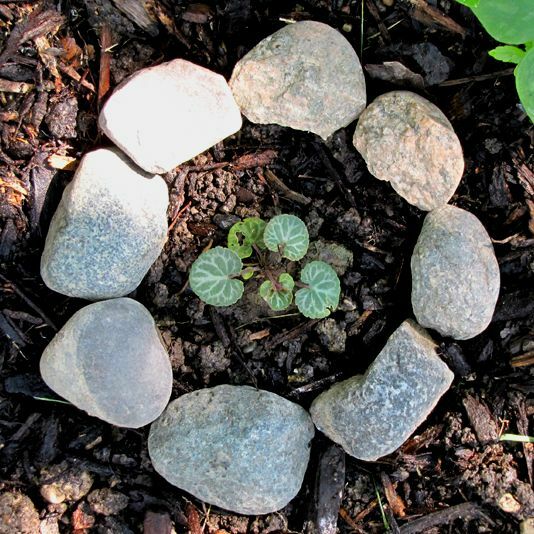 I planted them in the shade of a couple of maple trees, smack in the middle of Max's Garden. Now, about that soil issue... I'm doing just what I do for the azalea and the blueberries, which is to mulch with pine needles. That will help acidify the soil and I also supplement watering with a soil acidifying product I got at Lowe's a few times during the season. I'm hopeful the lingonberries will do well. Your next question might be to ask what I'm going to do with the lingonberries when I get some. It likely will not be this year, so I've got plenty of time to decide, but I think I'll make a sauce to put over meatballs, like IKEA did. It added a nice, tart flavor to the meatballs. I may make some jelly, too. We'll see! Lingonberries are very common in Sweden, which is why IKEA serves dishes made from them. 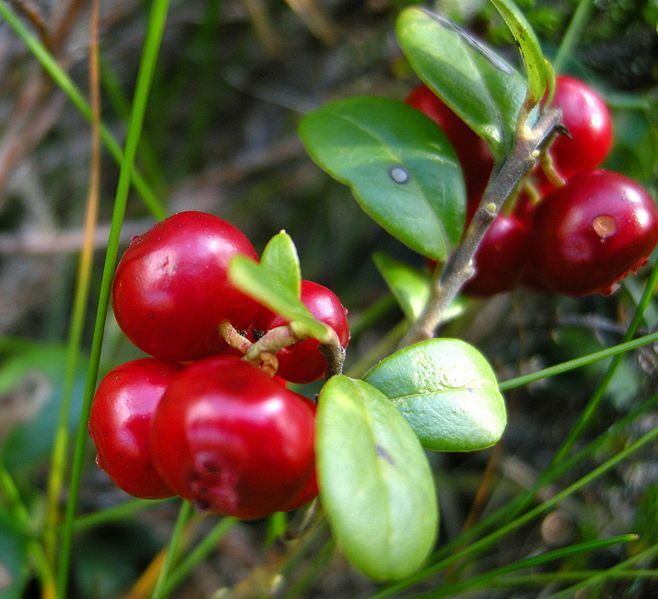 They have a taste and texture similar to cranberries, but they're smaller in size. Place lingonberries in a large pot with the water and bring to a boil. Boil for 5 to 10 minutes, and skim off any foam from the surface. Stir in sugar, bring to a rapid boil, and continue boiling for a few more minutes. Ladle jam into sterile jars, leaving 1/4 inch of headspace. Cover with lids, and screw on rings. Process in a hot water bath for 10 minutes to seal. Refrigerate jam once the jar has been opened. We purchased a bag of seed potatoes, which don’t look much like seeds at all. They look like the potatoes in my refrigerator when I forget about them. The eyes had started to sprout, which in the case of seed potatoes is a good thing. Those sprouted eyes were what we were going to plant. We cut the potatoes into pieces with two or three eyes on each piece and let them dry out for a couple of days. Then we made “hills” in the garden, about 18 inches apart. In each hill, we put three of the pieces of potatoes about six inches apart and four inches deep, then covered them with soil. That’s all we did, and mid-summer, about two weeks after the plants began to die back, we dug up potatoes! This year, we’re growing them in a new way (for us). We got discarded black plastic 55-gallon barrels from Romie’s place of employment and cut the bottoms out of them. We placed topsoil in at a depth of about 8-10 inches, layering it with compost, then placed four sections of seed potatoes on top and covered them with soil about four inches deep. Potatoes planted in the barrels on April 3rd broke through the soil on April 17th. These are from one section of potato which had three eyes. As the potato plants grow to about eight inches high, we’ll continue to add soil to about half the height of the stems, and the plants will keep on growing. More importantly, they’ll keep making potatoes, since they form above the parent eye. 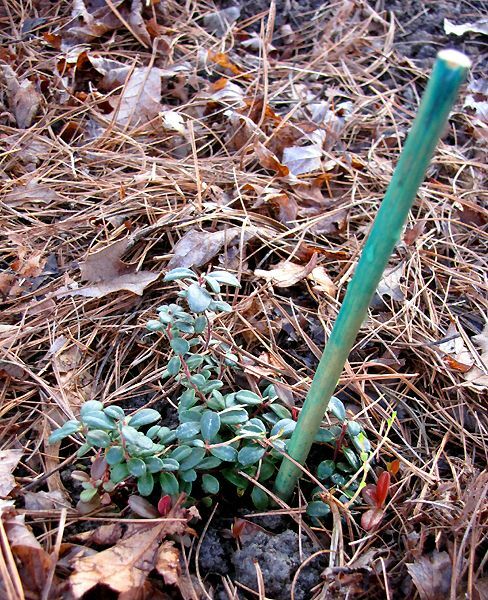 Once they start growing, don’t add compost, since that can contribute to scabby skins. You can also add sawdust or straw and the potatoes will form in that. 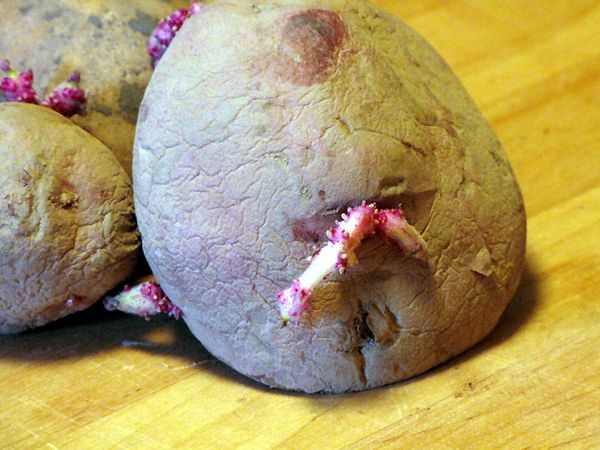 It just goes to show how adaptable potatoes can be. 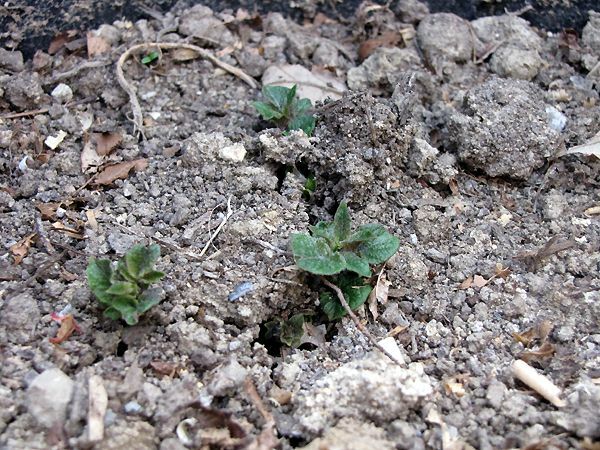 Potatoes like cool growing weather, so plant them about two to three weeks before your last frost date. 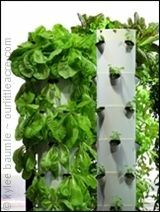 Depending on the variety, they should be ready for eating in about 90 days. We're fast approaching the end of our formal training as Master Gardener students and we've talked about how quickly it's gone. I think it's because we're all learning so many interesting things about an activity we love. And from the comments I'm getting, it sounds like our classes are a little more interesting and fun than some. Class VII had us learning about "Why Trees Matter," presented by Lee Richter, from the Toledo Botanical Garden. We spent some time talking about the dreaded Emerald Ash Borer, which is such a problem in our area. Soon, ash trees will be a rare thing to see here, which is sad, because it's such a beautiful tree. Since most of our classes are held at the Defiance County Extension Office and it's out in the country, we all bring our lunches to eat there. The day was beautiful and sunny, so we quickly ate and then went outside to take a walk around the property. 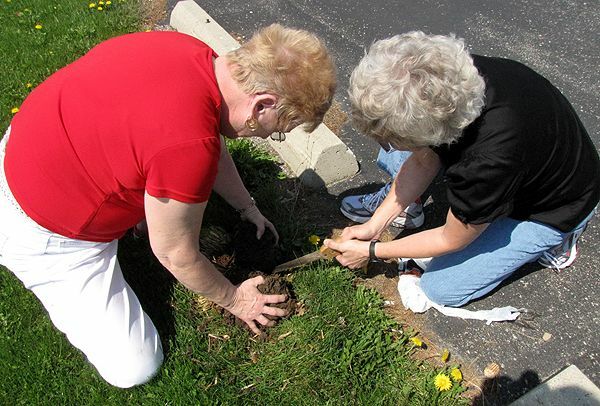 Brenda holds the grass, while Cathy saws it in two. One of our fellow students had brought some ornamental grass to share, so some dividing was going on in the parking lot before we had to go back in for the afternoon session. 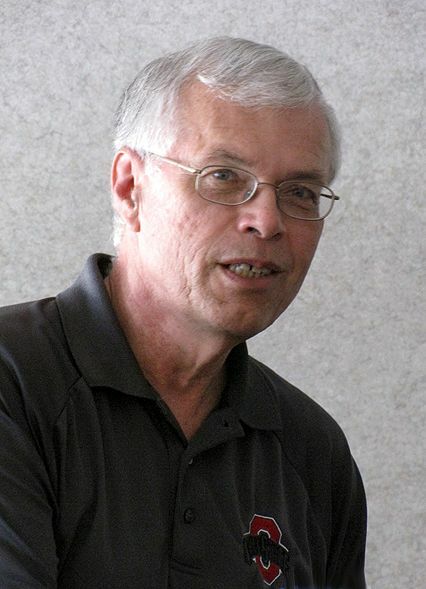 Steve Prochaska, OSU Extension Educator for Crawford County, gave us plenty of food for thought about pesticides and their use. 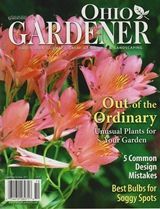 Though I try to garden organically, there are times when something a little stronger is necessary, so it's good to know how to use those types responsibly. I'll be missing the next class, which is on turfgrass and Horticulture Hotline Diagnostics. 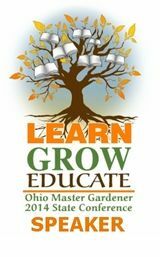 I'll be attending the District III Garden Writer's Association meeting in Cincinnati for two days and Mom and I will be attending the Cincinnati Flower Show, which is going on at the same time. The week after that is our last class, when we'll take our final exam. Then we'll go into the volunteering phase of our training, where we'll spend at least 50 hours doing volunteer work of various sorts. The calender is screwy this year. The gardening calendar anyway. We are clearly ahead of schedule compared to most springs in terms of breaking dormancy and bloom times. I've been walking on eggshells sort of, wondering if all the wonderful blooms will be zapped by a freeze, which could come at any time. 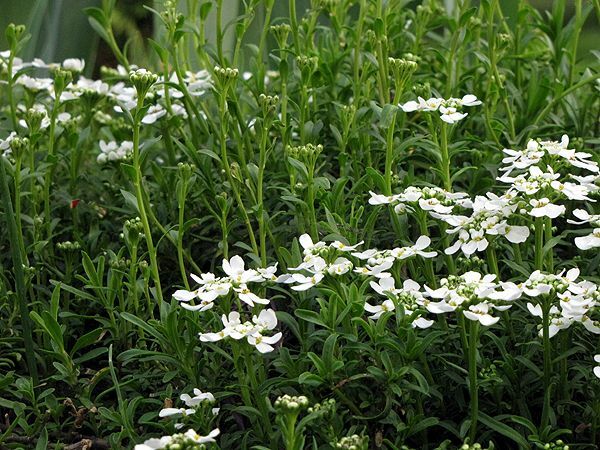 Our average last frost date here is May 15th and the general rule for planting annuals and warm season vegetables is that you wait until Mother's Day. I'm not sure I can wait that long. The flowers sure haven't! 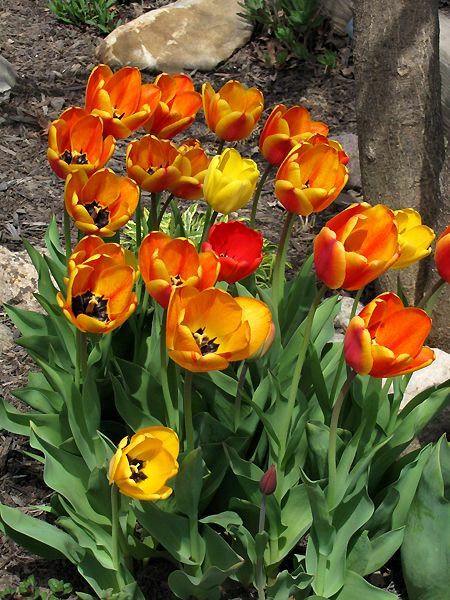 If I had to pick one tulip to grow, it would be any of the species tulips. They're unique and charming and reliable. I like the veined variegation on these leaves. I've also got 'Emerald Mist' but it's being slower to emerge and hasn't bloomed quite yet. 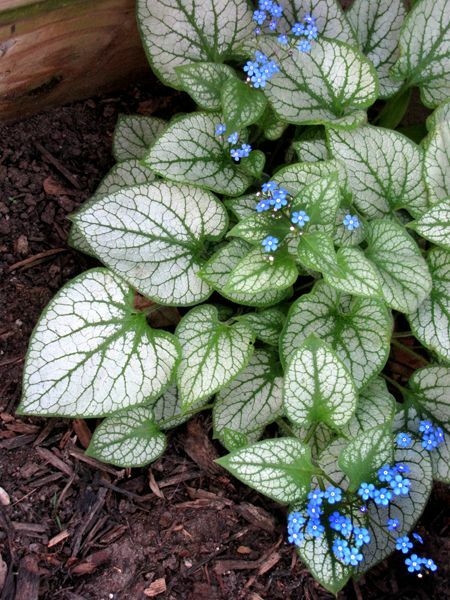 The straight species Brunnera is loaded with blooms. 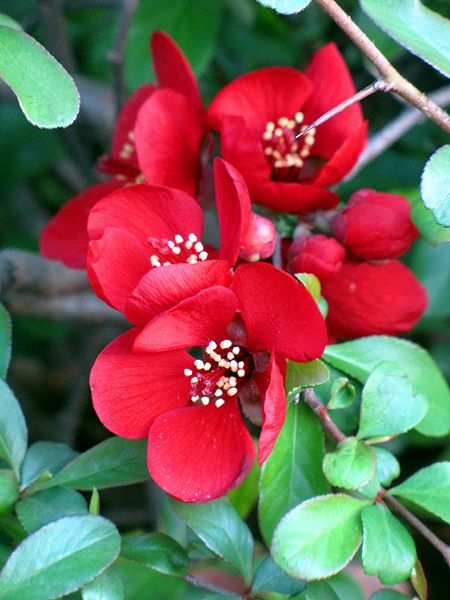 Gorgeous red color, and they produce fruit, too. It looks like there may be enough this year to make something with them. It's a good thing I like these violets. They pop up everywhere. I think these blooms look like satellite dishes. 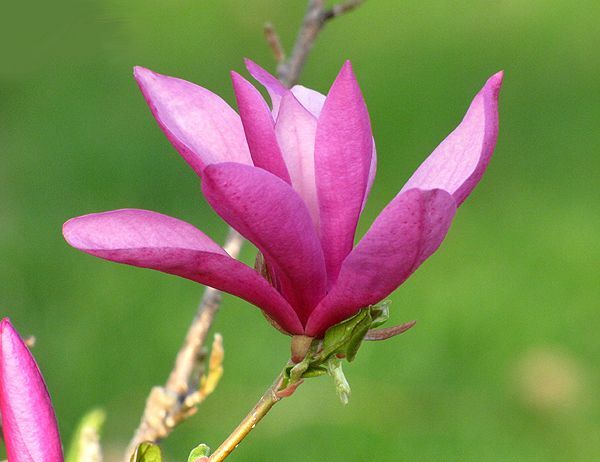 This is my favorite magnolia. Very frilly and feminine. 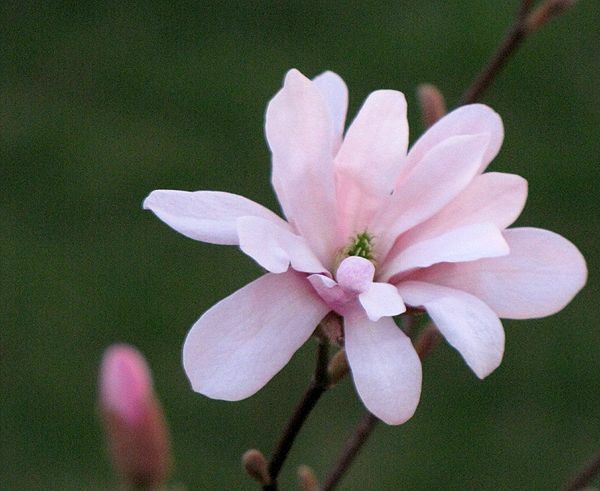 This year, 'Leonard Messel' was almost done blooming when 'Jane' was just beginning. Usually, they're blooming more at the same time. But this year isn't usual. I've got 'Pink Panda', too. 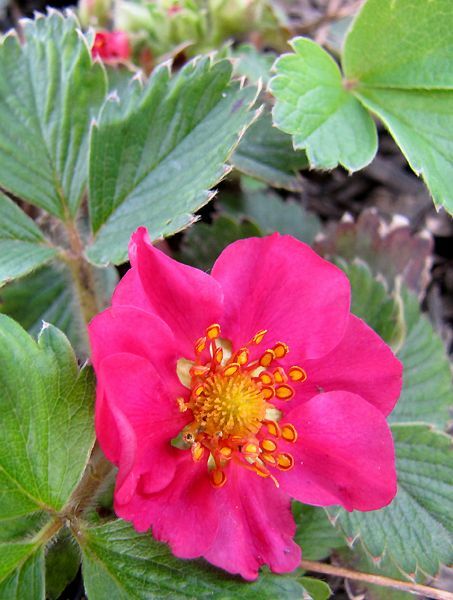 Not only do they have beautiful blooms, they taste good, too - like wild strawberries, packed with flavor! This isn't in full bloom yet. When it is, it's a solid mass of white. This is the third time I've planted these bulbs and the first time any have come up. Several put up foliage, but only one bloomed. I'm hoping the others will bloom next year and that they'll be the purple ones. I rescued this one from Lowe's several years ago. 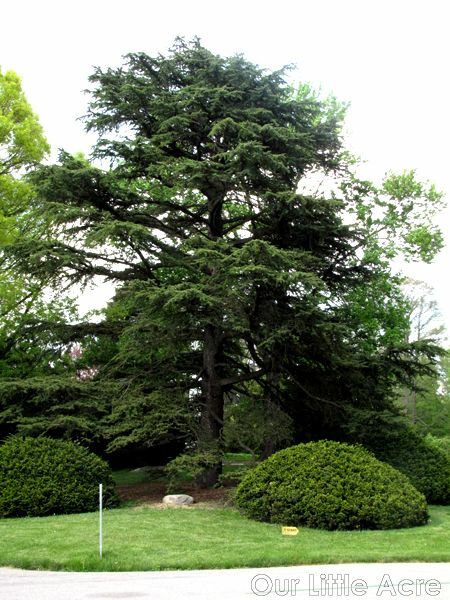 It battled powdery mildew that first year, but has done just fine in the years since. 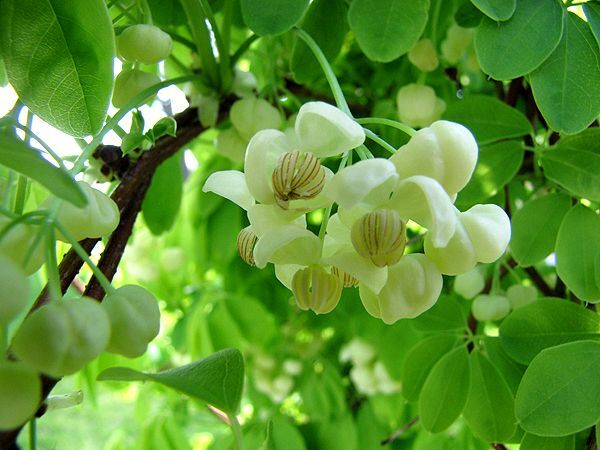 I would love to have the purple form, known as Chocolate Vine, but this white one is beautiful, too. I really like its leaflets and its 'wild hair' vining habit. It only blooms in the spring. 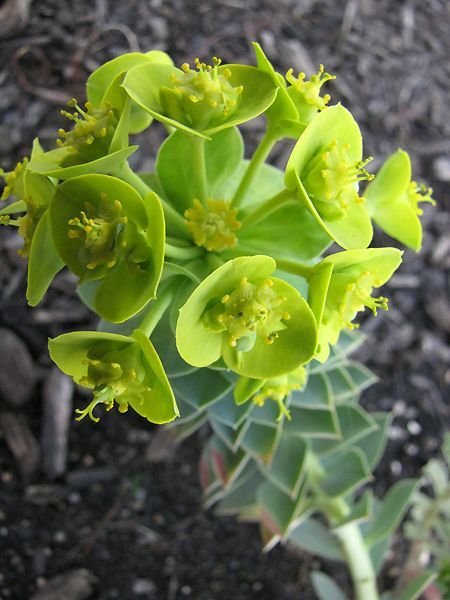 This is definitely a rock garden plant. Give it too much water and it will quickly die. The foliage is like moss on steroids, forming a loose mat. 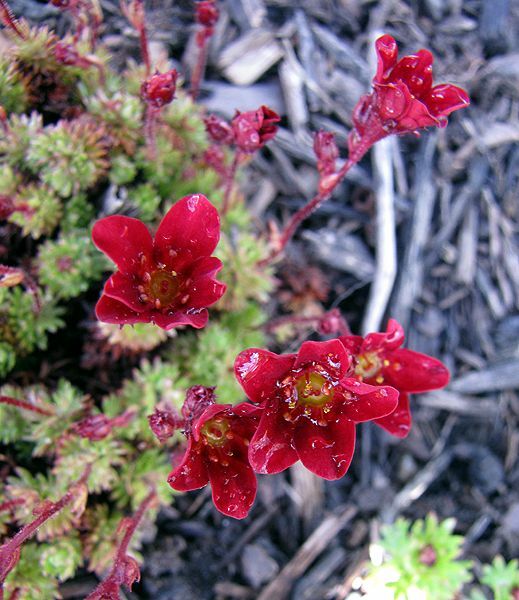 This small shrub flowers before it leafs out. It has a beautiful fall color of reddish-orange and yellow. While I've got early, mid, and late season daffodils, they all seem to be blooming at the same time this year, with one exception ('New Baby'). 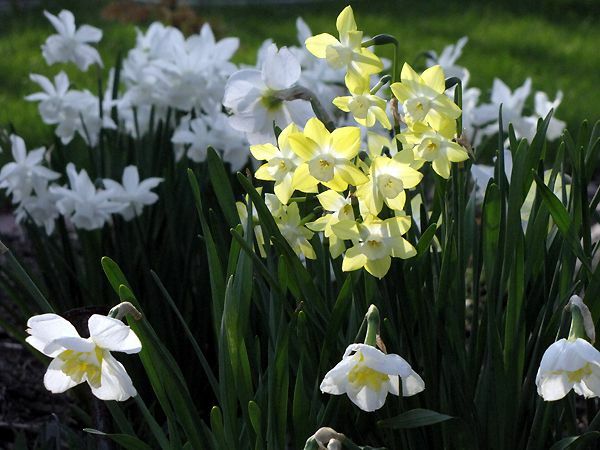 In this photo, the graceful white 'Thalia' are in the background, with yellow 'Pipit' in the midground and 'Lemon Beauty' in the foreground. Never in my five years of gardening have I experienced such an explosion of growth and blooming as we're having this spring. A month ago, I said that I thought we would have an early spring, due to indicators in my garden. The birds were giving signs, too. And besides, we were DUE. While we have a month yet before we pass the date of our average last frost - May 15th - I think the warm weather has lasted long enough now to safely say spring came early this year. That doesn't mean we won't have a frost or two yet, but it wouldn't surprise me if we didn't either. It's Garden Bloggers' Bloom Day, and I literally can't keep up with everything that's blooming or has bloomed up to this point. 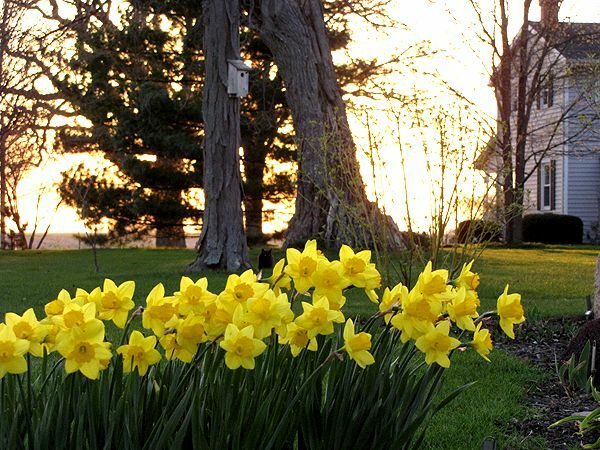 How did we go from squealing with delight over seeing the first crocus blooming to deadheading daffodils and hyacinths so quickly? A part of spring is already over. The wildflowers are blooming all over Our Little Acre. 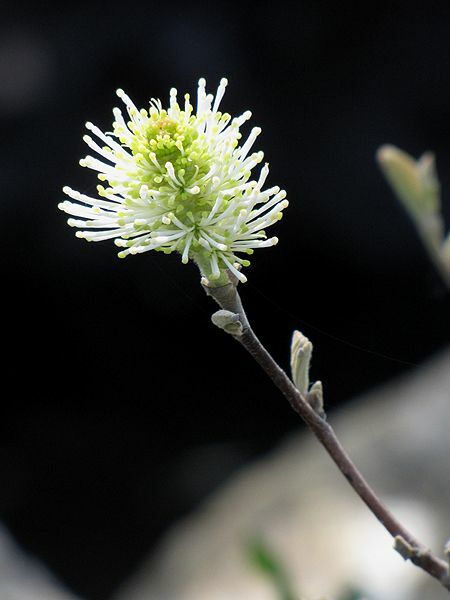 Certainly on Wildflower Way, but also in the shade garden below the serviceberry on the north side of the pool house. 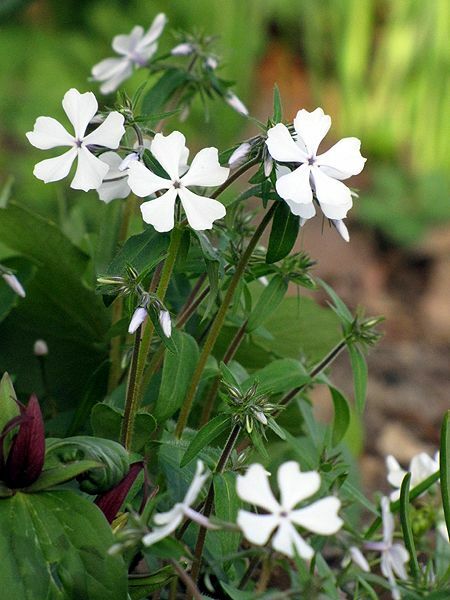 Today, I'm featuring those wildflowers that I love so much. Tomorrow, I'll show the rest of my blooms. 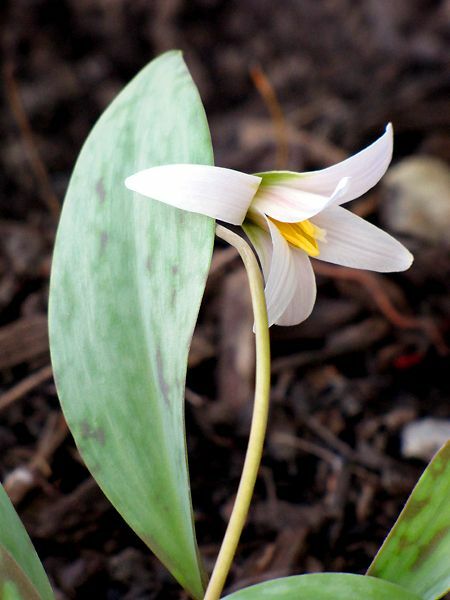 I've had Trout Lilies for several years, but only the white variety. This year, a yellow one appeared! There are no others around for more than half a mile, so I'm not sure how this happened, but there it is. 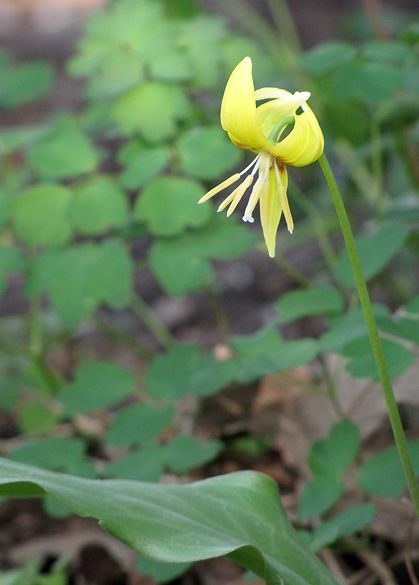 Another unusual thing is the foliage isn't mottled, and that is a characteristic of Trout Lilies, which is how they got that common name. 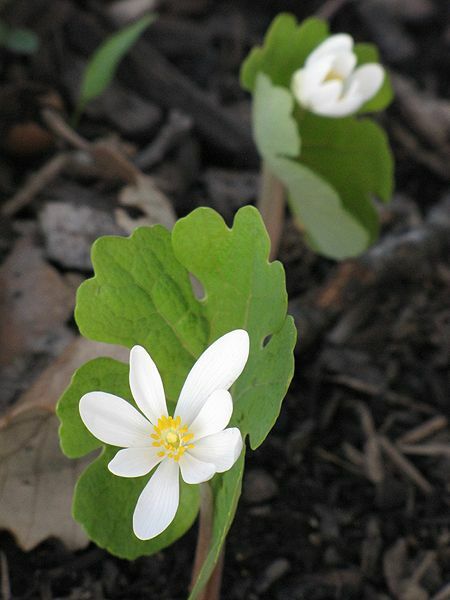 Bloodroot is one of my favorites. I love the white daisy-like blooms and the uniquely shaped foliage makes it even more appealing. 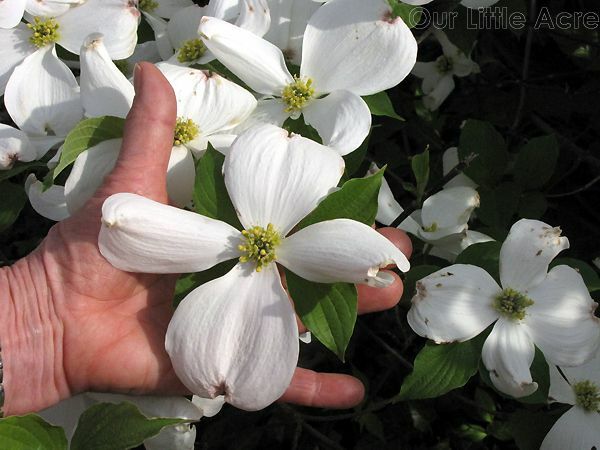 It gets its common name from the fact that its roots appear to "bleed" when broken. 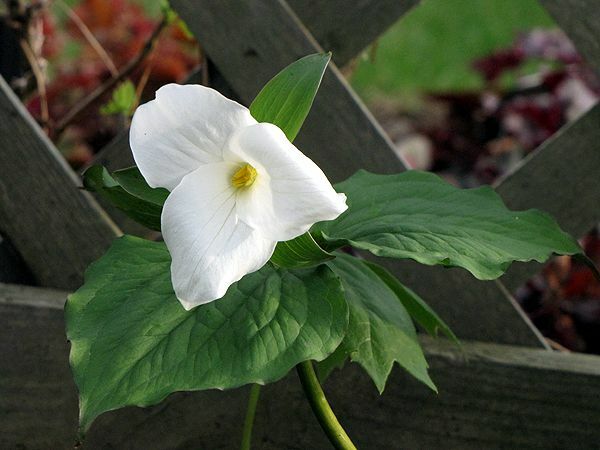 Giant White Trillium is Ohio's state wildflower. In my immediate area, Toadshade Trillium is much more common, but we do have the white. 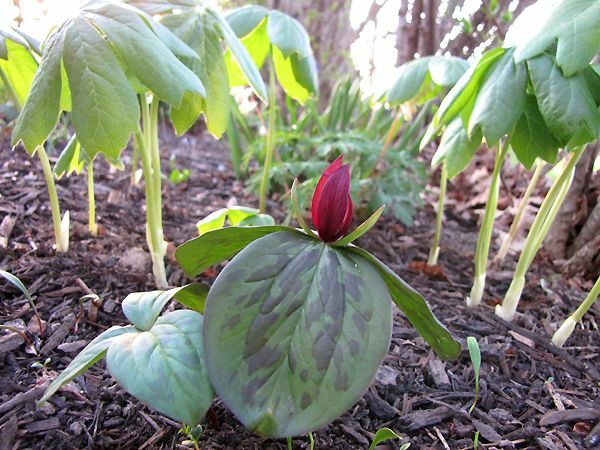 "Giant" is a great adjective for this trillium! 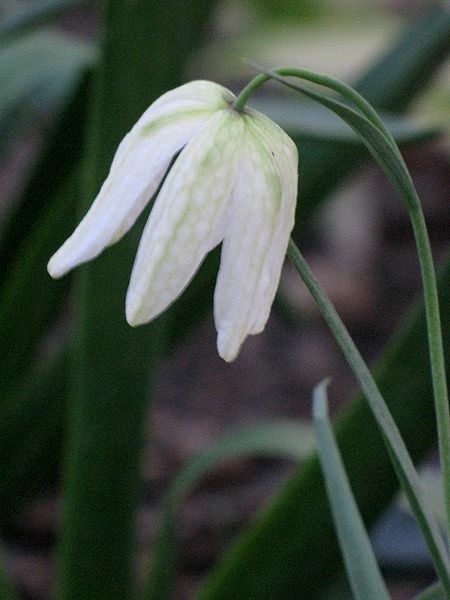 Spring Beauty is normally more of a pale pinkish color, and has pink veining in its petals, but this one is showing more of a plain white color. I'm pretty sure it is Spring Beauty, but if anyone knows it to be something else, please share that information! Another of my favorites among the spring wildflowers is Jack-in-the-Pulpit. I've only seen one in the wild in my life and that was in the woods behind the new Holiday Inn in Ft. Wayne (across from Memorial Coliseum). I was geocaching there and came across one. Not knowing a thing about them, since this was in my pre-gardening days, I wanted to dig it up and take it home. 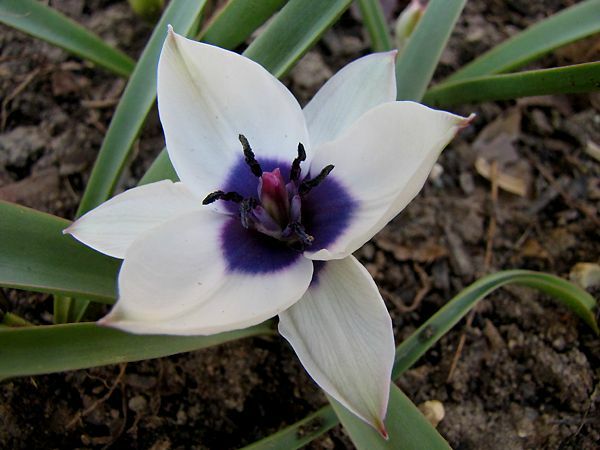 I hadn't a clue that it was a bulb, or that native plants normally have very deep origins, so of course, all I got when I dug it was the flower on its stem and some foliage. I took it home and planted it. It died. That Jack-in-the-Pulpit is probably still growing in its original location unless it got dug up in the hotel construction process. 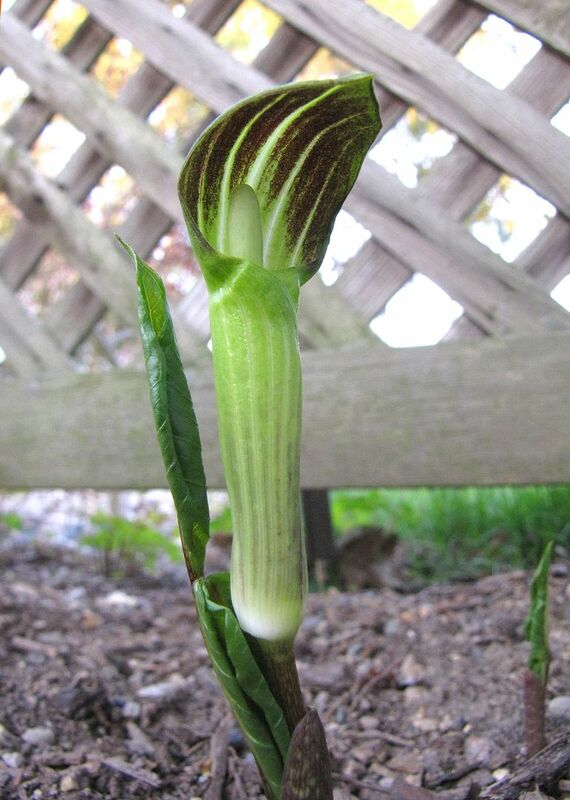 I purchased one online, which has not yet appeared, but a couple of years ago, I wintersowed some seeds that Mom had given me from her Jack-in-the-Pulpit. They germinated well and I had lots of seedlings last spring, but no blooms. This year, they're up and blooming! 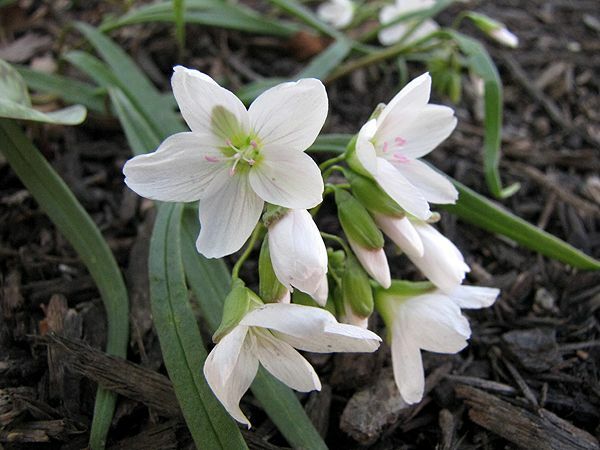 One of the first wildflowers I learned to identify was Dutchman's Breeches. You can tell they're in the same family as Bleeding Heart (Dicentra spectrabilis) by looking at both the foliage and the bloom. 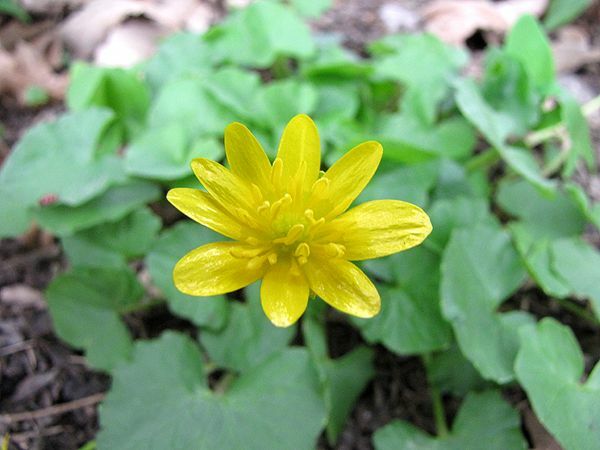 This Lesser Celandine magically appeared a few years ago out in Max's Garden. I moved it to Wildflower Way last year. These can be invasive, but it doesn't appear to be behaving that way for me. 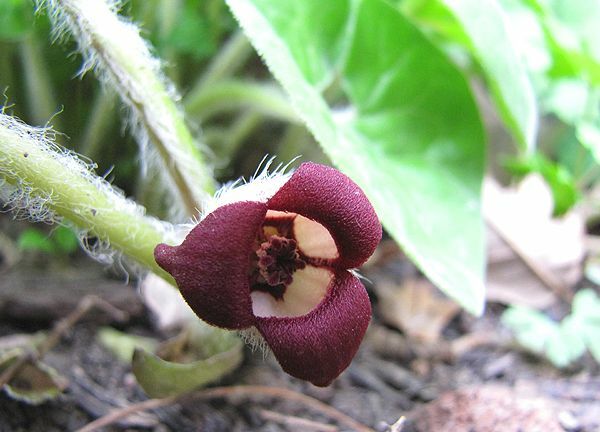 Wild ginger grows everywhere here. 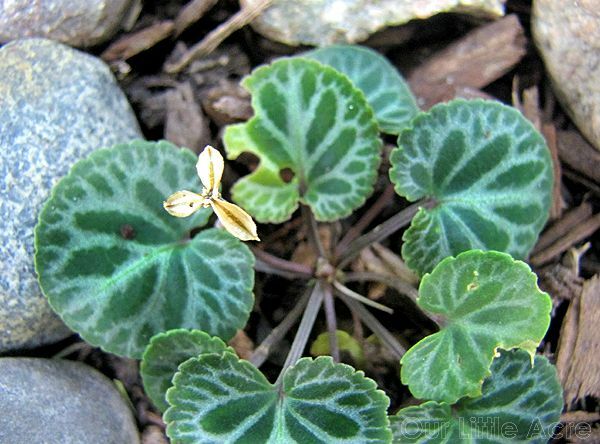 I love the heart-shaped leaves, but their best-kept secret is their flowers! You have to go looking for them, because they're under the leaves, very close to the ground. 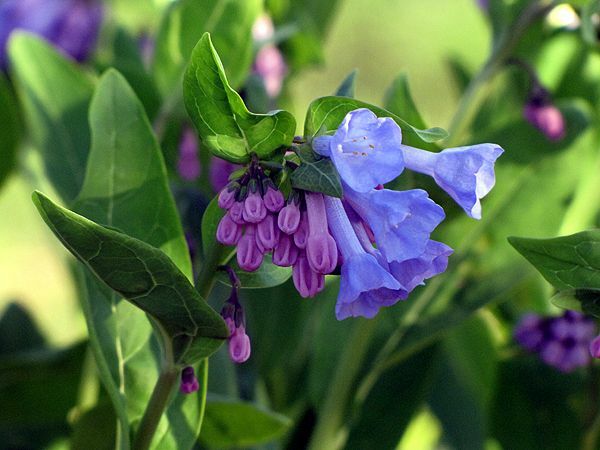 Virginia Bluebells can be stunning when you see them in a drift. That's how I first saw them while out geocaching with my friend Marsha one spring. 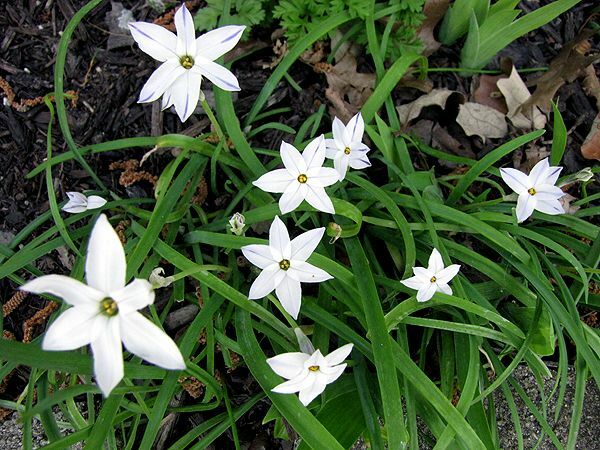 They were growing on a shaded river bank and we oohed and ahhed over them. A year later, Romie and I went back and dug a few to plant here. Those have now naturalized quite nicely in just a few years! I've even shared some of mine. 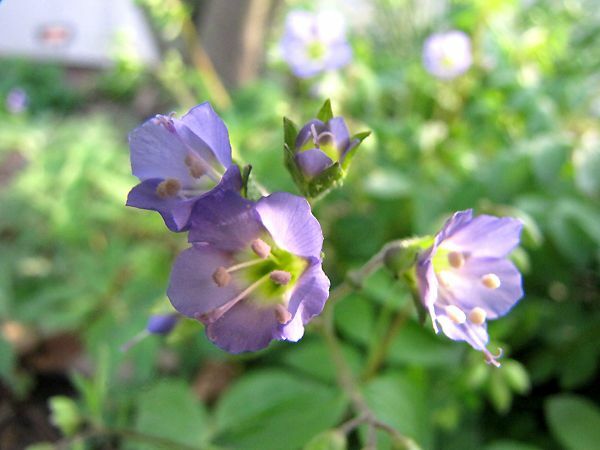 I've had trouble getting the hybrid Jacob's Ladders through the winter here, but the native one, which I think is just as pretty, does just fine. 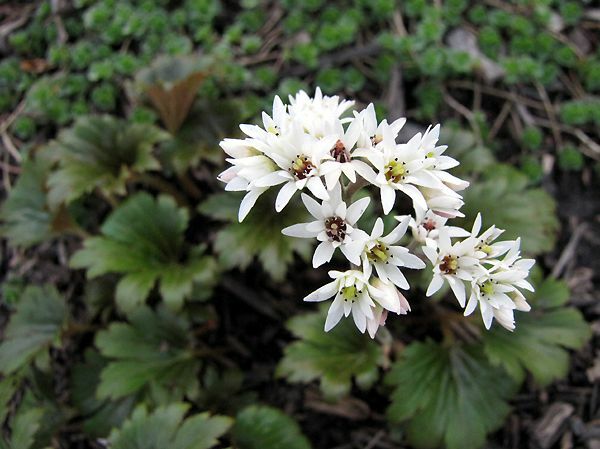 The Sharp-lobed Hepatica has already bloomed and there are some blooms yet to come, such as Mayapples and Star of Bethlehem. 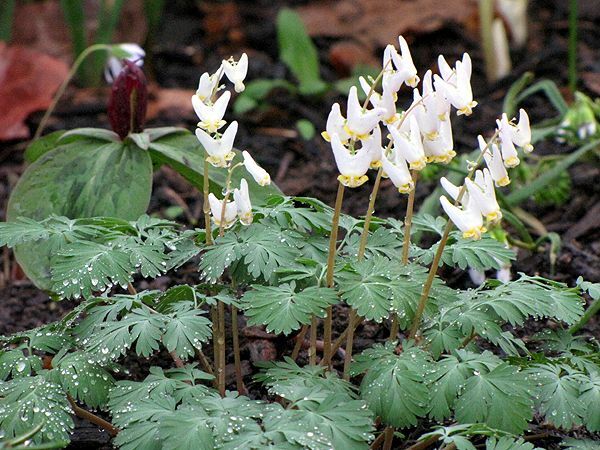 But April is certainly the best month to see these in the woods and in my garden.